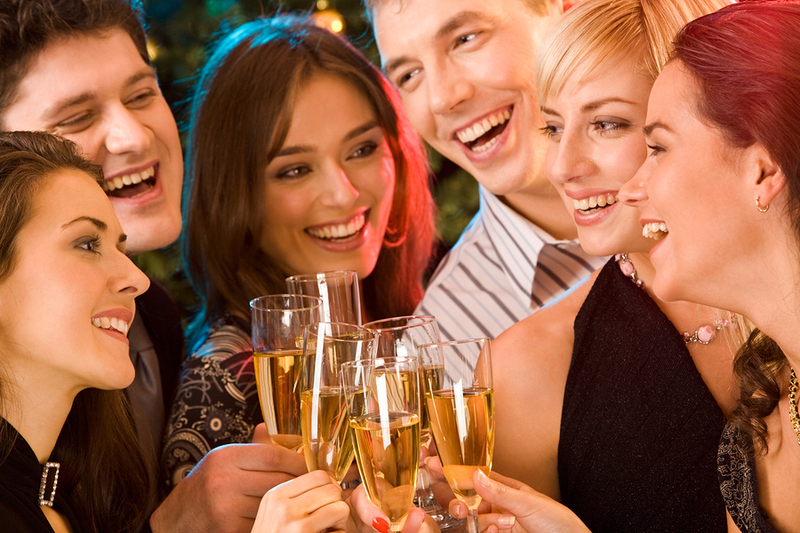 So you’re in the middle of preparing for a huge dinner party for your work colleagues. Or your daughter just graduated from college, and you’re throwing an informal cocktail gathering for 50 of your closest friends. Below is a list of some of the collections we love (and stock!) and how each piece best captures the personality of your event. 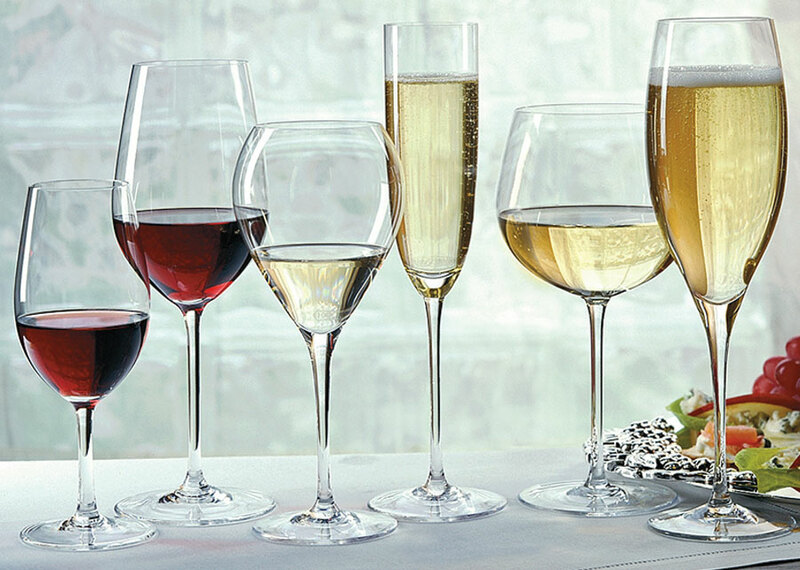 Riedel glassware is arguably the most traditional and elegant wine glass around. Your guests will hold a Riedel glass in their hand like it’s an old friend. 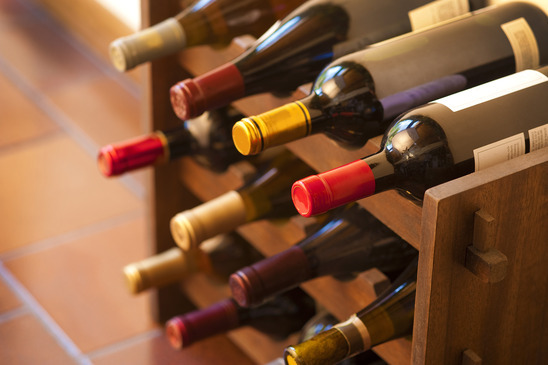 A favorite of restaurateurs and bar owners, it has the advantage of not only being well-crafted, but also stands out as a classic piece in any wine connoisseur’s china cabinet. Looking to create a little edgy cool atmosphere? 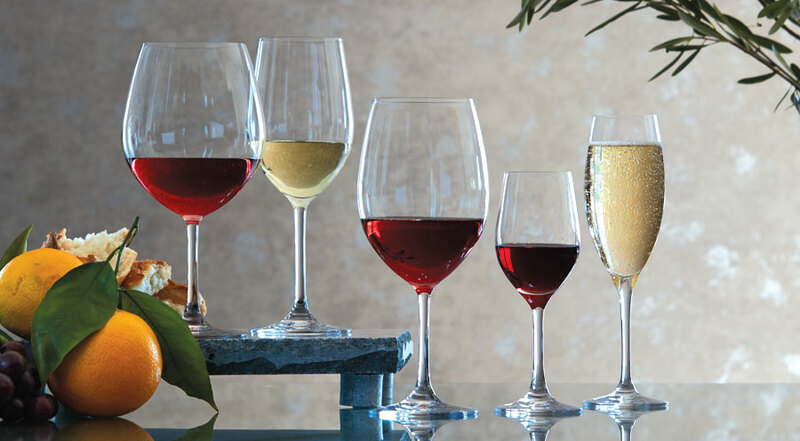 The Riedel O stemless collection brings a modern edge to your soirée (and did I mention it’s my personal favorite?). Riedel Sommeliers wine glasses were praised by Robert Parker as ‘The finest glasses for both technical and hedonistic purposes. 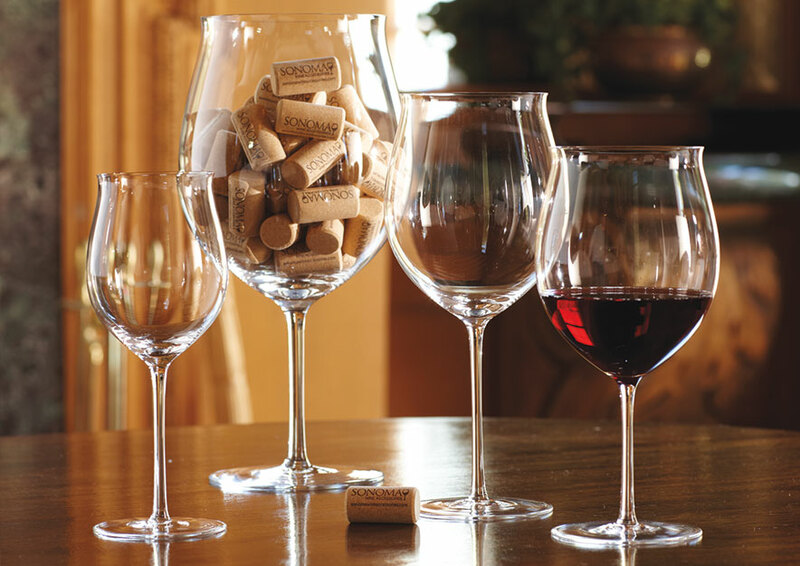 What Riedel stemware says: You’re both classic and old hat at this entertaining game. And, because you know your stemware, you obviously know your wine, too. Best for: Large parties, bar service at weddings or wine lovers who entertain a lot and need a quality, versatile glass. Expert tip: If you’re renting glassware for a big event, any rental company worth their salt will have Riedel in stock. Bottega Del Vino carries the same elegance as the Riedel collection, but its shape invites a more decor-minded owner. The Rosso glass is slightly fluted, meaning it’s likely to get noticed and will be a topic of conversation among your party guests. And though the bowl is large, the glass settles comfortably in the crook of your hand, making it a good choice for occasions when the pours might be a little more healthy. What Bottega Del Vino stemware says: You’re not afraid to take a chance. You like to impress and get your guests talking. Best for: Small, intimate dinner parties at home, or anytime you set a complete table. Expert tip: Mix your glassware for a professional-looking tablescape! Use the classic Riedel red and white wine glasses, and set Bottega Del Vino Rosso Marone wine glasses as water glasses instead. Gorgeous! Sometimes, simpler is better. Ultima’s design is simple-sleek, and with fewer pieces in the collection, these glasses are a good choice to keep at an arm’s length in your kitchen cabinets. Plus, Ultima glasses have great clarity, and are break-resistant and dishwasher-safe. Not as traditional as Riedel or Bottega, the Ultima still has a classic look, but is modern enough to pull out for an impromptu glass of Tempranillo when your best friend drops by unannounced. Favored by winery tasting rooms, Ultima Stemware are brighter, stronger and more durable than other glasses on the market. 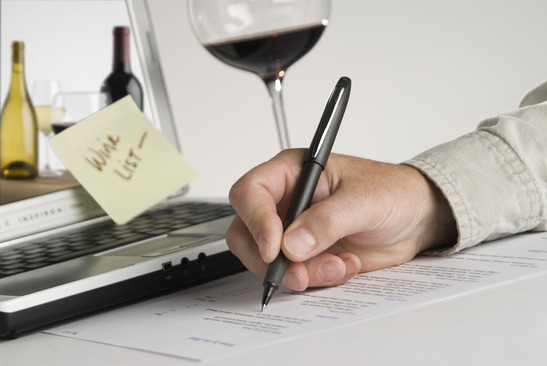 What Ultima stemware says: Good wine is better enjoyed without all the fuss. And better sipped with friends. Best for: Everyday glasses with a twist that you can pull out at a moment’s notice. Expert tip: Use beautiful glassware every day (especially when it’s beautiful and affordable). We all have those glasses we save for “special occasions,” but why not use them all the time? Life’s too short to worry about broken glass! For the more decor-minded entertainer, Lucca glassware is the obvious choice. The etching along the rim dresses up your table without the need to add a centerpiece, napkin fold, or other table decor. The glassware speaks for itself. These stunning machine crafted glasses are lead free and feature a delicately etched scroll motif for an impossibly beautiful, elegant finish. What Lucca stemware says: Fancy, huh? 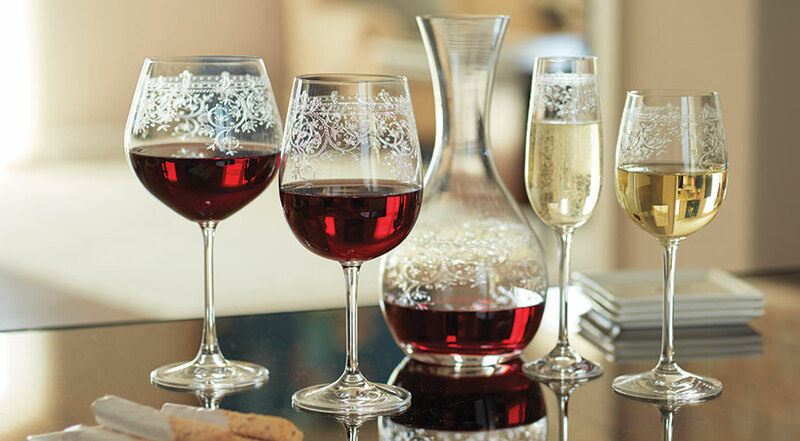 Lucca is perfect for entertaining because it adds an elegant visual detail to your guests’ wine-sipping experience. And because Lucca is generally a secondary set of glassware in the wine connoisseur’s cellar, your guests know you’re really pulling out all the stops to entertain them. Best for: Holidays, when you’re feeling a little more festive than usual. A lush, Italian-themed dinner party in the backyard. Anytime when you need to impress. Expert tip: Not sure if you can pull off a whole table full of Lucca stemware? If you’re setting wine on the table, use a Lucca pitcher. Not only does it enhance the quality of your tasting experience, the pitcher’s detailing can have the same gorgeous effect, without making your table feel complicated. About the author: Lauren Caselli is a professional event planner and blogger on entertaining. She’s planned over 100 events from 10-person intimate dinner parties to 300-person industry conferences. Find out more about entertaining and wine at www.laurencaselli.com. Don’t forget to add crystal to your list. Over on my blog you can see how the most beautiful crystal can not only make your wine and your table look incredible – it also adds to the pleasure of drinking it. There is nothing quite like crystal! Great blog by the way. Lovely to see another lover of fine glassware and fine wines to go with them! I’ve always heard that the sound a glass makes is dependent on the quality of the glass. The trick to telling the difference is to fill the glass halfway with water, then dunk your finger in the water, and gently rub it around the rim. I’ve heard glasses that are of high quality will ring loudly. Is there any truth to this ?